Quotes on Walking – Start Now! Generally, walking is associated with healthy lifestyle and movement. Walking is a great way to exercise and make your mind relaxed after a hard working day. A great amount of people are involved into this wonderful kind of journeying. Check 25 quotes about walking to make you move on. Develop the habit of walking in the morning. Any form of physical exercise can help you stay in shape. If you want to have balanced mood, try walking. There is a deep connection between positive mood and walking. The importance of physical activity is hard to exaggerate. Walking can make you enjoy the life to the fullest. Inspire yourself for a long-distance walk. Exercising makes your personality free. Walking with friends is the sweetest treatment. Walking is exactly a good exercise for every one. Keep walking and you will find the right path. Walking is beneficial for mental health. Walkers are up from those who are exhausted by laziness. Sports can be connected with relaxation. 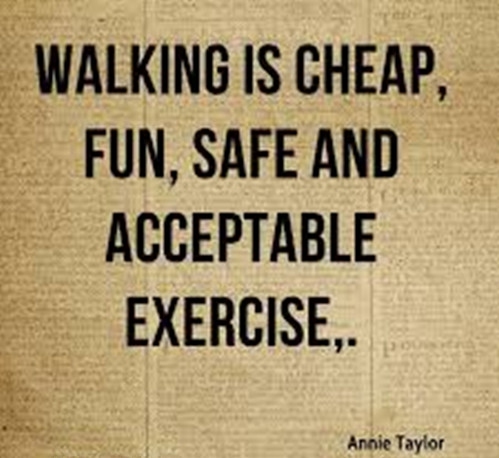 Walking is the cheapest kind of exercising. Walk assists in studying extraordinary things. Create a better version of yourself by walking. Walking is created to make your mind free. You can never know where the road will take you finally. A walk on a gloomy day is a divine blessing. Freedom is found when we fully embrace the independence of walking. Fancy exploring the enormous world on foot. "Romantic" words from our list of quotes about walking: enjoy walking!